Have you ever been fired? Thomas Edison got canned once. In 1867, he was fired from his job in Louisville at the age of 20 when he spilled sulfuric acid on his boss’s desk (as so many of us have). 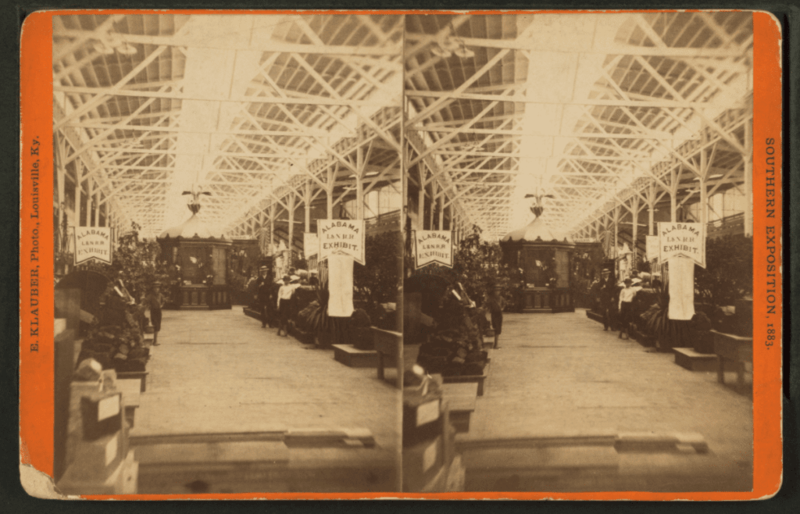 But he got, arguably, the best payback ever 16 years later when he returned to feature one of his newest inventions, the incandescent lightbulb, at the Louisville Southern Exposition. He lit up his old town with nearly 5,000 bulbs—the largest gathering of electrical lighting at that time. 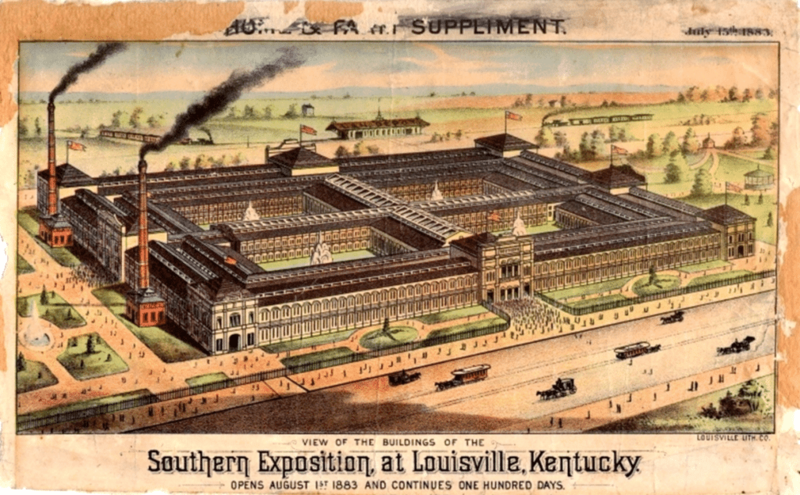 If you’ve never heard of The Southern Exposition, it was one of the largest fairs of its time and a towering achievement for Louisville. It was so popular that it ran for 100 days each year for 5 years from 1883 to 1887. So thanks to Edison’s payback, for five years Louisville was quite possibly the brightest place on earth. Also, thanks to Edison’s lights, it was the first event of its kind that could remain open after dark. It was the brainchild of Henry Watterson, who worked as the editor of The Louisville Courier. After Atlanta swiped his original idea to host a Cotton Expo, he expanded his fair to be a celebration of all things southern—agriculture, manufacturing, culture, art—the whole picture. He believed that the south had a great many treasures to share with the world, and wanted to help repair the rift caused by the Civil War. One of his mottos was “Battlefields are behind us, fields of labor before us.” And even though neither of those options sound particularly enticing to us, Watterson was a man with many talents. He even won a Pulitzer prize for a couple of editorials calling for US intervention in The Great War. But that was long after the success of the Southern Exposition. 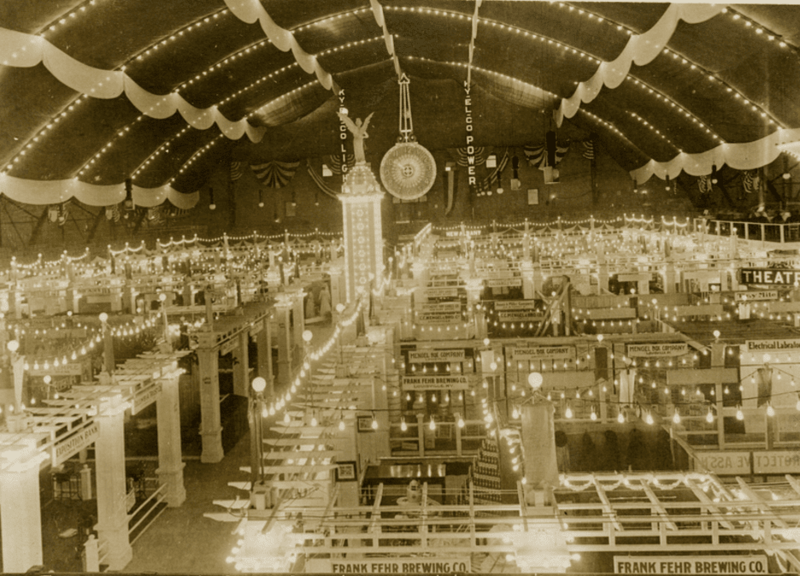 The fair was staged over 45 acres where “Old Louisville” currently exists today. We assume it was new back then. The main building, which occupied 13 acres, might be the largest wooden building ever constructed in the United States. In the 180,000 square foot building, they even managed to construct a ½ scale Mayan temple. President Chester A. Arthur was there to open the expo. And it was packed. It was only supposed to run for 100 days, but in that time nearly one million visitors came to see Louisville’s tribute to the south. That’s when they decided to extend the show for a five year run. But for Watterson, The Southern Exposition went beyond showcasing the south. He was a loyal Louisvillian, and wanted to bring the world to see his town. Considering we built our distillery downtown, we completely understand that desire.